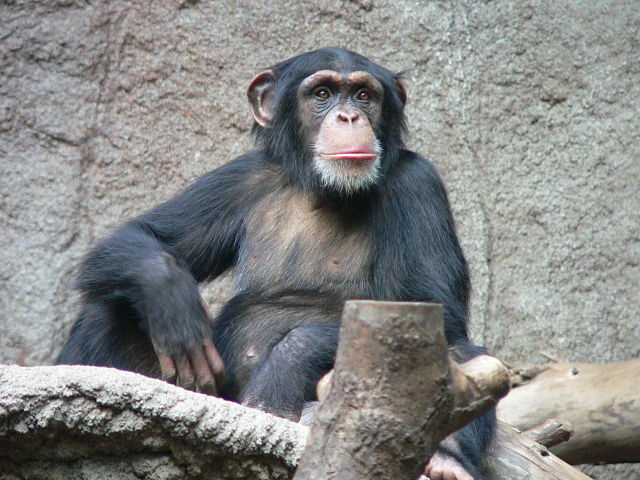 Some wild west African chimpanzees are teetotallers, whereas others are frequent drinkers given the opportunity – consuming the equivalent of three pints of strong lager per day. These findings have been reported in a scientific study that lends support to the drunken monkey hypothesis, which suggests humans and their primate relatives are attracted to the smell of alcohol because in our common evolutionary history this indicates the presence of energy rich, albeit fermenting fruits. And this could help explain why people and some primates become addicted to alcohol. The latest study, published in the journal Royal Society Open Science, describes how a group of wild chimpanzees in Guinea occasionally found and raided the sites of palm alcohol production. Often drinking from breakfast until nightfall – although, interestingly, only on one occasion was an individual observed who had had a few too many. As I always tell my research group as we head off for a happy hour on Fridays – alcohol in appropriate doses increases creativity and of course helps us relax. It would appear that chimpanzees may also be regulating their intake. Most of us have experienced the consequences of not regulating our alcohol intake – and I like to illustrate this in lectures about social behaviour by citing a 1970s study which used pigs to study alcoholism in humans. Pigs housed in groups of seven were given access to lots of alcohol three times a day. However, unlike the chimpanzees, these pigs overindulged from day one. Pigs have a fairly rigid pecking order, which of course is hard to maintain when everyone is drunk. In this experiment after a few days the pig that was third in the hierarchy sobered up and moved up to be the dominant individual in the group. The previously dominant pig, perceiving its loss of status, then also “dried out” and regained its place at the top of the food chain. This situation cascaded down the social hierarchy, except for those at the bottom who appeared to sense they had nothing to lose from being inebriated. Thus – for species which need to maintain their social status and where politicking is important – being able to control one’s alcohol consumption is vital. Vervet monkeys living free on the Caribbean island of St Kitts have also developed a taste for alcohol and are infamous for stealing cocktails from tourists. Studies have shown that if offered the choice between sugary water or sugary water with alcohol they choose the latter. And will drink enough to change their behaviour, but not necessarily enough to get drunk. A number of studies on the voluntary intake of alcohol in primates and rodents in laboratory settings have shown that manipulations such as separating individuals from their social group for significant periods of time can induce a significant increase in alcohol consumption. This pattern of drinking behaviour may become fixed for a previously stressed or anxious individual. This explains to some degree why individuals may turn to alcohol – but not necessarily overindulgence. If you overindulged regularly like the aforementioned pigs you would lose all your social standing. Furthermore, studies of addiction using a variety of highly addictive morphine-based drugs have shown that rats from an enriched environment (lots of space, stimuli and opportunities for social interactions) do not usually use freely available drugs to get “high”. But those moved to rat paradise from a stressful environment (solitary confinement in a small cage without stimuli) where they have become addicted to narcotics, usually give up their addiction. One cannot help but feel there are important lessons to be learnt from such studies. The question then is, other than humans, which species if any regularly drinks to intoxication? As a child I remember watching videos of staggering elephants who had gotten drunk from eating fermenting marula fruits. But apparently this documentary was a set-up. Physiologists have calculated that for elephants to get drunk they would have to eat fermenting marula fruits at four times their natural consumption speed for a whole day: so while possible it is unlikely to be a common occurrence. The hardest drinker appears to be a species of Malaysian treeshrew that regularly drinks naturally occurring alcoholic nectar in doses that would intoxicate humans. But they don’t appear to get drunk, perhaps due to the long evolutionary association between these animals and alcohol. All this suggests that if the drunken monkey hypothesis is correct, humans and our ancestors were probably not regulars at nature’s bar. But as Berkeley primatologist Katherine Milton points out, it could just be that humans like the intoxicating effects of alcohol, especially because its use is often promoted culturally and drinking excessively is not frowned upon in all societies. Robert John Young is Professor of Wildlife Conservation at University of Salford. This article was originally published on The Conversation. Read the original article.